CLICK HERE TO DONATE TO MUD! MUD is a 501(c)(3) non-profit organization registered with the State of Montana. This means that your tax-deductible donations contribute to youth in Missoula learning about rain water harvesting, adults learning how to fix lawn mowers or keep bees, and to a large collection of tools for gardening, carpentry, and more that helps increase our self-sufficiency and nurture our community spirit. Please consider us when you are doing your yearly financial planning. MUD can accept gifts via BuzzPoints! Use your accrued points to support MUD. If the standard gift options do not accommodate your donation interests, please contact the MUD office to speak with our development staff about planned legacy giving, bequests, and other donation options. 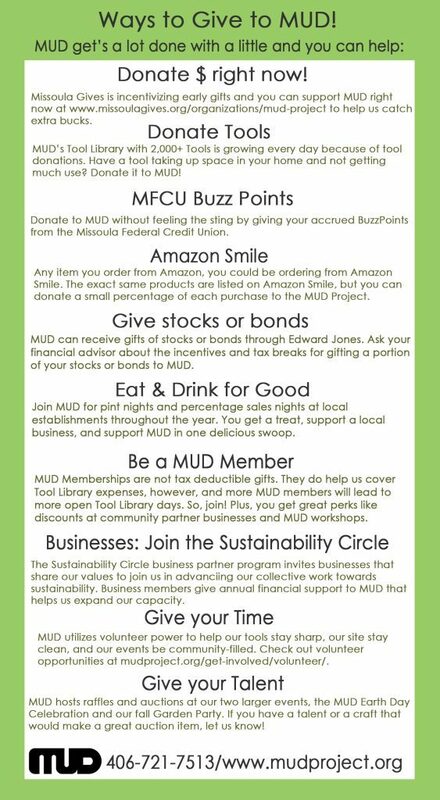 MUD’s Sustainability Circle program is a way for businesses to partner in support of MUD’s efforts. For details on referral business packages check out our Sustainability Circle webpage. Our Tool Library is one of our proudest and most enduring features. After taking our workshops or purchasing recycled materials from our neighbors at HomeResource, many of our members check out tools from our library to help them with all their DIY projects. However, creating and sustaining a Tool Library of this size is no easy feat, so if you’d like to donate to the library, please call us (406-549-6790) and confirm your donation with a Tool Librarian prior to bringing it to the site. In order to be safe, keep the tools in tip-top shape, and make sure you get a donation receipt, we ask that you please only leave donations with a Tool Librarian during our Tool Library hours. MUD often needs items as well as financial donations, including, but not limited to tools. See the list below for our immediate wish list items. New blades for saws of all types.